It’s no secret that everything is better with video. Better traffic, better conversions and an unbeatable ROI. There are just some video conversion stats that are so off the chart that we just can’t understand why more people aren’t jumping on board! In fact, when’s the last time you opened an email and there was a video in it? We can’t remember either! To make sure you’re taking full advantage of the best marketing tactic available, here are five simple but high-converting video strategies you can start using immediately to improve your conversion rates fast! 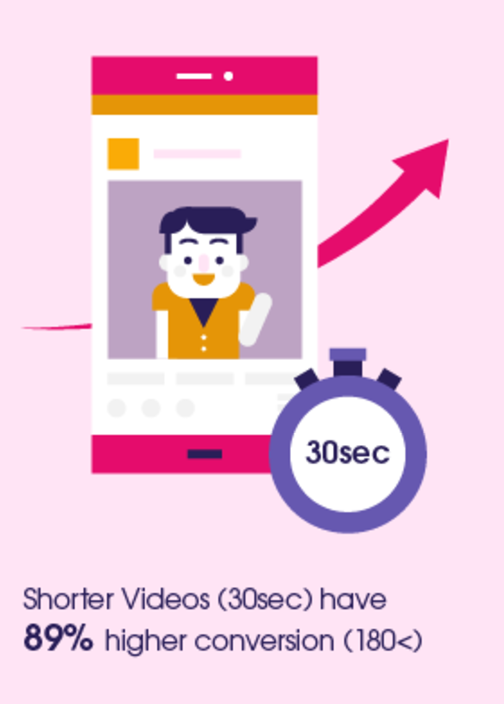 While there’s definitely a place for longer product and explainer videos, videos that are 30 seconds or less hold your audience’s attention span longer and convert 89% better. That means you can break up long content into several bite-sized videos over time and convert more customers with the same content. One of the most effective ways to take advantage of video is by pairing it up with another marketing heavy-hitter, your email. Think about how many newsletters/emails you send out - are you including video? Chances are probably not and that’s costing you. Just how much? Recent stats show that personalized video can increase your click through rates by 200%-300%. On videos that you can rate, make sure you’re having customers and employees rate that video five stars! Why? Stars matter. A five star rating is attributed to a 3.76% conversion rate, which is about 276% more than a video with only one star. Stars = conversions! Instead of lengthy copy on your homepage, swap out the copy for video. 70% of marketing professionals report video converts better than any other mediums. When it comes to eCommerce, more video on more pages = more sales and higher average orders. 73% more web visitors who watch product videos will buy while retailers who use more videos on more pages are experiencing a 68% increase in the average order amount. Convert more, convert at a higher dollar amount and put a dent in the abandoned shopping cart dilemma. Each five of these video strategies are simple, but generally overlooked because people think video is complicated or has to be an all out professional production in order to produce a video that’s “good enough” to get traction. This simply isn’t true. Personalized videos, webcam videos and “live” style are all good enough to connect with your audience and convert traffic. CloudApp makes it easy to record a professional but personal video that’s ready to add to your homepage, email or social accounts in just minutes. Start creating high-converting videos with CloudApp by creating a free account!